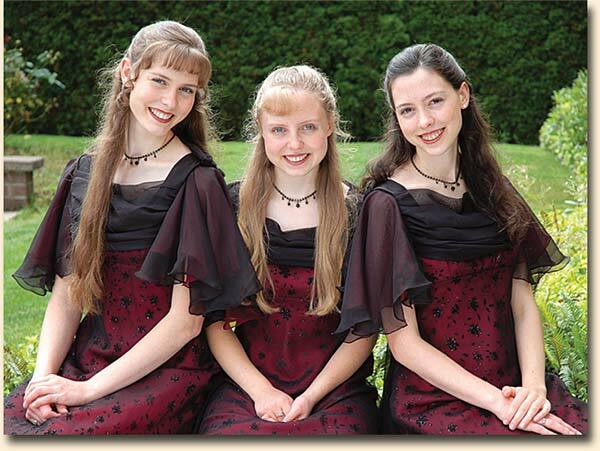 The angelic voices of Seraphim are those of Christa, Lisa and Theresa Hanson. Best known for their beautiful harmony and blend of voices, they bring to the stage a spirit of joy and entertainment for the glory of God. 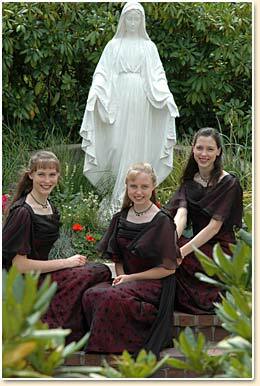 Their love of music and a desire to share their talents with the world has led the three young sisters into performances in numerous places across the U.S. They have received many honors as well as being featured on worldwide television and radio. Seraphim has proven to be a delight to every audience. "Seraphim" is comprised of Christa, Lisa and Theresa Hanson, three of the nine member “Hanson Family Singers.” Music has always been an important part of their lives; Wayne and Leslie (dad and mom) met while singing. Through the many years of being in church choirs, the girls heard four part harmony even before they were born. At an early age, a great love for music grew from the special times with dad before bedtime, when he sang "Edelweiss", "Home on the Range" and many other songs to the girls as he tucked them in. They loved to just listen, but sometimes they would sing along. "You are My Sunshine" was a favorite and one night dad decided to teach the harmony to one of the girls. Asking Lisa to plug her ears, he quietly sang the harmony to Christa. Then he gave them a note and counted the beats to begin. The first notes were as they should have been, but then the girls switched and Lisa sang the harmony perfectly. From then on at every opportunity the girls sang in two parts for friends, family and in concert. When Theresa’s voice joined the girls, she sang melody. It continued this way until 2000, when the girls decided to try singing three parts. They picked out an old hymn and each took a part. It worked! They then sang every song they could in three parts. Since 1985, the Hanson Family has performed in the Eugene, Oregon area as well as many other places across the U.S. 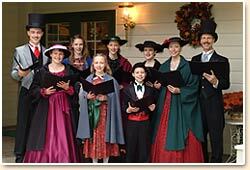 They sing year round for many different occasions and have twenty to forty singing engagements for the Christmas season. Their talents were honored when the youngest members, Theresa (then 10) and Daniel (then 8), placed in the finals at the Oregon State Fair after winning the 2002 talent contest at the Lane County Fair with an exciting yodeling duet, "The Man in the Moon is a Yodeler." 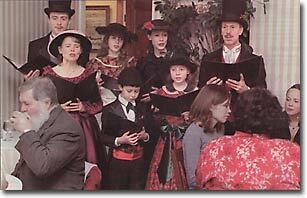 This event and the Hanson's December Christmas caroling in Victorian costumes were topics of four great articles in local newspapers and a national magazine. 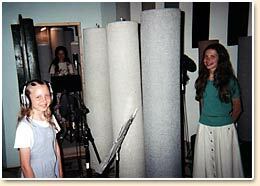 In 2002, producer David Phillips heard the girls sing a fun and lively barbershop song during a concert with their family. Approaching them later he asked them to sing a three-part piece in a musical Easter production. They did, and were excited when he produced their first cd, "O God of Loveliness" in the fall of 2003. 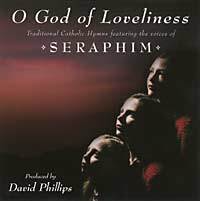 Taking the name of "Seraphim", the young sisters went into the studio to record 12 traditional hymns beautifully arranged in three-part harmony. "O God of Loveliness" quickly became a favorite as Seraphim sang for Mass at their parish, and bookstores across the nation began to order and sell "O God of Loveliness". A busy couple of months started in August, 2003, when singing yodeling songs, Lisa and Daniel placed in the finals at the county fair talent competition with Daniel winning first place and Lisa second in the fifteen and younger division. September, the girls recorded background vocals on a song for David Lomond, “The Hawaiian Elvis”. 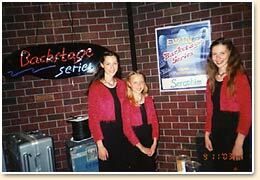 Heartbeat Records flew "Seraphim" and family escorts to Birmingham, AL where they did a half hour show for "Backstage", broadcast worldwide on EWTN (Eternal Word Television Network). The following month, by invitation of UCMVA (United Catholic Music and Video Association), "Seraphim" sang the Bach-Gounod “Ave Maria” at the prestigious "Unity Awards" in Ohio. 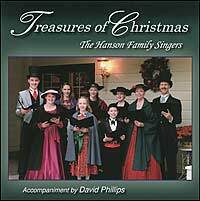 November, The Hanson Family Singers released, "Treasures of Christmas" a beautiful collection of traditional Christmas favorites. It was available in about twenty local outlets and sold over 600 copies the first year. It is now available in many stores nationwide. 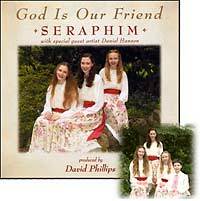 "God is Our Friend", the second "Seraphim" album was released in August, 2004. 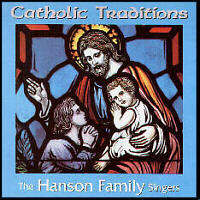 This cd includes a variety of traditional and upbeat sacred music and features their younger brother Daniel on three of the songs. 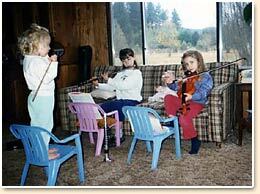 August, 2004 found the four youngest back at the Lane County Fair talent show where each of them did solos. Christa (then 19) placed 3rd in the adult division with a gospel song called, "No More Night." 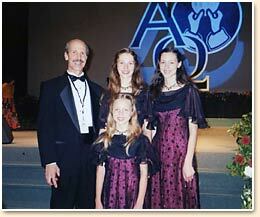 Theresa (then 12) won "Grand Supreme Winner" with a cute yodeling song called, "Ricochet Yodel." She went on to take 2nd at the state competition. August of 2005, Seraphim won 2nd place in the Lane County Fair talent show with the Bach-Gounod “Ave Maria” from their cd "O God of Loveliness". November of 2005 they traveled to Albuquerque, NM with their family for the Western Music Association Festival, where they entered a harmony contest with their own arrangement of "In My Adobe Hacienda". The audience loved them and they made a close run for 1st place. 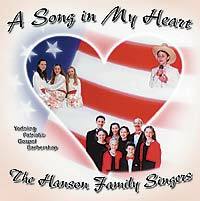 Another Hanson Family cd, "A Song in My Heart", was recorded and released in 2004 featuring yodeling, patriotic, gospel, barbershop and more. It quickly became a favorite with their audiences. In February 2006, Seraphim was among hundreds of auditions held for the McDonald's Gospelfest in Seattle, WA, produced and directed by A. Curtis Farrow, - Irving Street Productions in Newark, NJ. They qualified for the finals and competed on April 8th at the beautiful Paramount Theater in Seattle, WA with seven other groups in the "Christian Music Group" category. It was a great experience meeting and performing with so many wonderful talented people. In addition to the competition, the fabulous Martha Munizzi and the "Duchess of Gospel" Dr. Emily "Cissy" Houston performed. Seraphim brought home the first place trophy, a cash prize and an invitation to compete in the New York City Super Shows in June. Accompanied by their family, Seraphim flew to New York City to sing and compete in the New York McDonald's Gospelfest finals held at the New York City Center Theater on June 15th. The audience received their presentation of the Bach/Gounod “Ave Maria’ with spontaneous applause throughout the song. First place was awarded to The Velazquez Family Singers who are very talented and were a favorite of the audience. This experience and the many others that New York City held for the Hanson family, made this trip unforgettable. August 2006, “The Hanson Sisters” in the tradition of the “Andrews Sisters”, performed “Boogie Woogie Bugle Boy” in the 2006 Lane County Fair Talent Show. After winning “Grand Supreme Winner” in the adult age category (16 and older), the sisters took their fun act to the state competition in Salem, OR where they placed 3rd. A year later, the girls entered the same act in the Marion and Polk County Fair Talent Shows. They finished in the top 10 at Marion County and were thrilled to place 2nd at Polk against stiff competition. 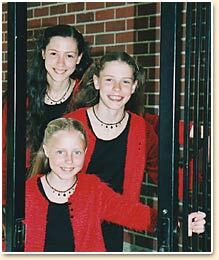 November 2006, The Hanson Family Singers competed in Albuquerque, NM in the Western Music Association Festival’s harmony contest with a rousing seven-part song called “Sing as You Work”, written by Isham Jones and originally done by “The Sons of The Pioneers” in a 1940’s film, “Romance on the Range”. They achieved the “Marilyn Tuttle Best of the Best Harmony Award”. 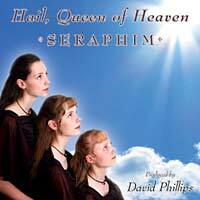 Seraphim’s third cd, “Hail, Queen of Heaven” was recorded and released the summer of 2007. It has a selection of some of the most beautiful hymns ever written honoring Mary, the Mother of God. Christa, Lisa and Theresa play in varying degrees, several different instruments, including piano, saxophone, clarinet, violin, accordion, guitar and mandolin. They each have students and teach piano and fiddle/violin lessons. The girls enjoy tap and other varieties of dance and have been in shows as well as performing numbers at the family concerts. The girls enjoy living on a two acre country place about fourteen miles west of Eugene in the Veneta area. They have pets and many other interests and hobbies.